Tacos don’t have to be just ground beef and shredded lettuce. There are so many yummy fillings that can go in a taco to make a casual yet delicious meal. On a gorgeous evening, we love to sit outside and eat shrimp tacos … while drinking margaritas, of course! (1) Toss together corn, tomatoes, orange bell pepper, jalapeno pepper (optional), and lime juice. Salt and pepper to taste. Set aside. (2) Preheat a large skillet over medium heat. Add olive oil, shrimp, garlic, cumin and chipotle. Cook, stirring occasionally, just until the shrimp are about two-thirds cooked. Add reserved corn mixture to the skillet. Stir to combine ingredients. Continue cooking until shrimp are fully cooked. (3) While shrimp finish cooking, warm tortillas. When shrimp are done, place two tortillas on each plate. Top with shrimp mixture then with shredded cheese. Serve right away. 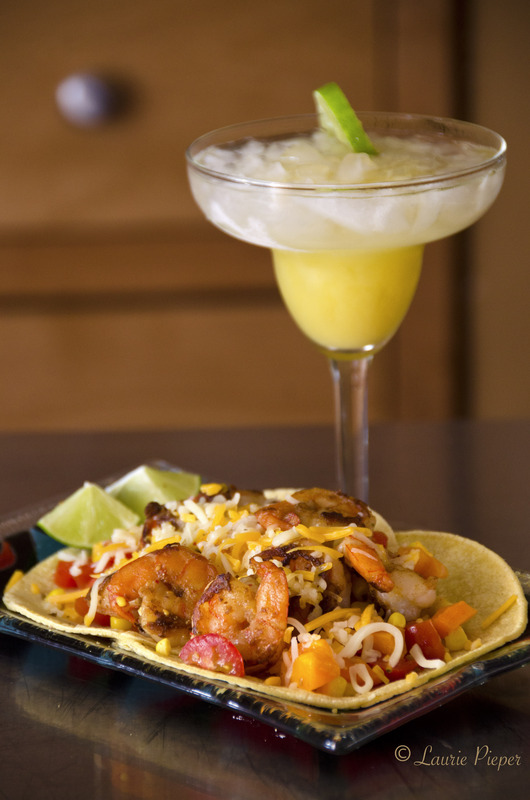 This entry was posted in Recipes, Savories and tagged Mexican Food, Recipes, Shrimp, Tacos. Bookmark the permalink.